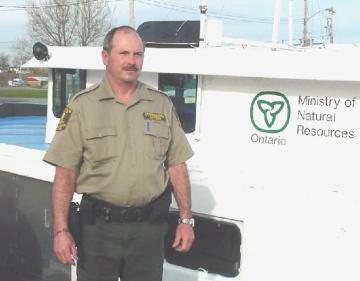 On September 22, 1999, without regard for his own safety, Conservation Officer Gary Caron attempted to rescue a person from a submerged vehicle at Wheatley Harbour on Lake Erie. Officer Caron and his partner Officer Cliff Rich witnessed a car, with the driver still inside, sink in the water of the harbour. While his partner obtained assistance, Officer Caron went into the polluted water of near zero visibility, not once, but twice before he was able to secure chains to the vehicle so it could be lifted enough for him to free the driver trapped inside. Although the driver of the vehicle could not be resuscitated, Conservation Officer Gary Caron is commended for his courageous act of valour, and attempted lifesaving actions.